Chanteuse Country Canadienne née Carroll Ann Baker, le 4 Mars 1949 à Bridgewater (Nova Scotia). Born in Bridgewater, Nova Scotia, Carroll Baker was one of the most popular female country singers in Canada. The daughter of an old-time country fiddler, Baker grew up preferring rock & roll to country until her family moved to cosmopolitan Ontario, where the sounds of country music made her homesick. In 1969, following encouragement from her husband, she joined a bar band in Oakville, Ontario, but was fired after only three weeks. 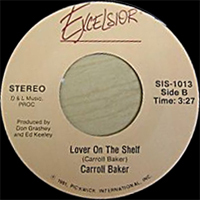 Baker was then asked to join a local radio program and was heard by sculptor George Petralia, who had written the song "Mem'ries of Home" and asked her to record it; the resulting hit stayed on the charts for 26 weeks in 1970. 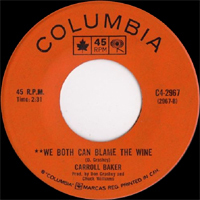 In 1977, Baker won Canada's Top Female Singer Juno award (she has won the award five times between then and 1995), and hosted her own TV show (The Carroll Baker Jamboree), as well as three specials for the CBC. In 1983, Baker moved to her manager Ed Preston's newly established label Tembo and has continued to enjoy considerable popularity in her native Canada. 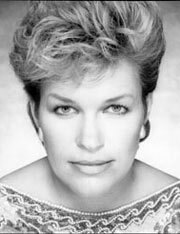 She scored two country hits in the U.S., 1981's "Mama What Does Cheatin' Mean" and "It Always Hurts Like the First Time" in 1985. 19?? SP COLUMBIA C4-2967 (CAN) . 1975 SP GNP / CRESCENDO 501 (CAN) . I've Never Been This Far Before / ? 1979 SP RCA JH-11940 (CAN) . 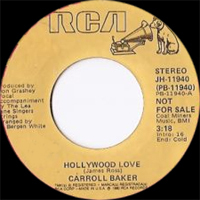 Hollywood Love / ? 1981 SP EXCELSIOR 1013 (CAN) . Mama What Does Cheatin' Mean / ? 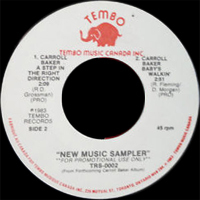 1983 EP TEMBO TRS-0005 (CAN) .